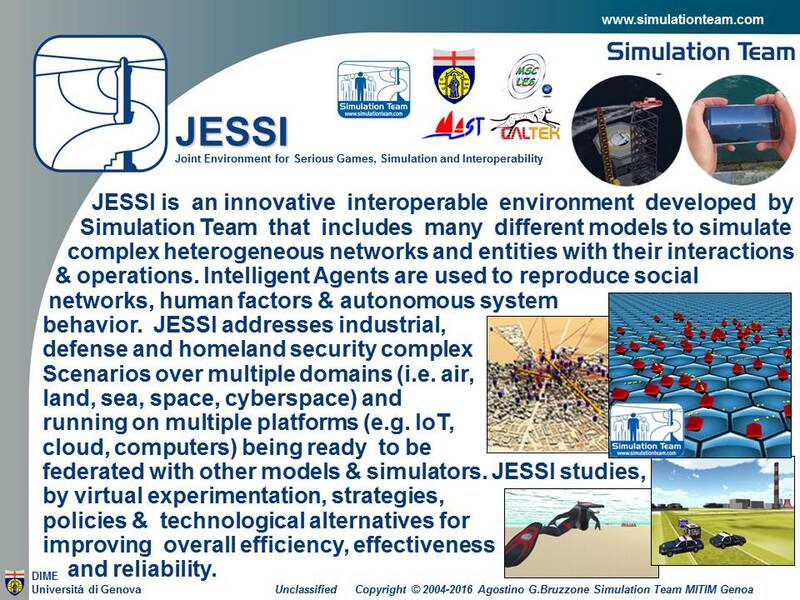 JESSI is an innovative interoperable environment developed by Simulation Team that includes many different models to simulate complex heterogeneous networks and entities with their interactions & operations. Intelligent Agents are used to reproduce social networks, human factors & autonomous system behavior. JESSI addresses industrial, defense and homeland security complex Scenarios over multiple domains (i.e. air, land, sea, space, cyberspace) and running on multiple platforms (e.g. IoT, cloud, computers) being ready to be federated with other models & simulators. JESSI studies, by virtual experimentation, strategies, policies & technological alternatives for improving overall efficiency, effectiveness and reliability.